Not all freeze dryers are created equal. LyoPro Advanced Tray Freeze Dryers combine advanced LyoPAT freeze drying tools into a simple, easy to operate freeze dryer. 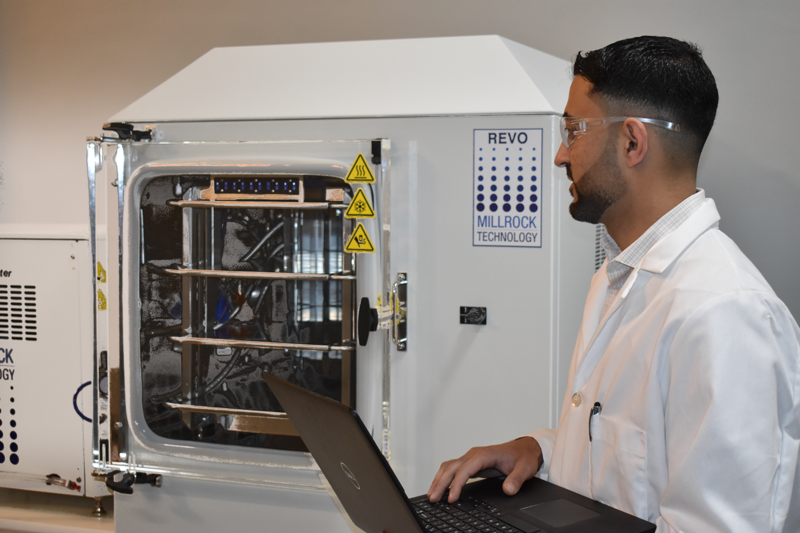 Field testing the LyoPro Freeze Dryers has created a robust freeze dryer platform customized for the needs of research scientists in charge of formulation development and survey, cycle optimization and cycle transfer. Focus on your product, not the process. The LyoPro Advanced Tray Freeze Dryers integrate and maximize the use of 3 powerful innovative tools helping to solve common freeze drying problems. 1. 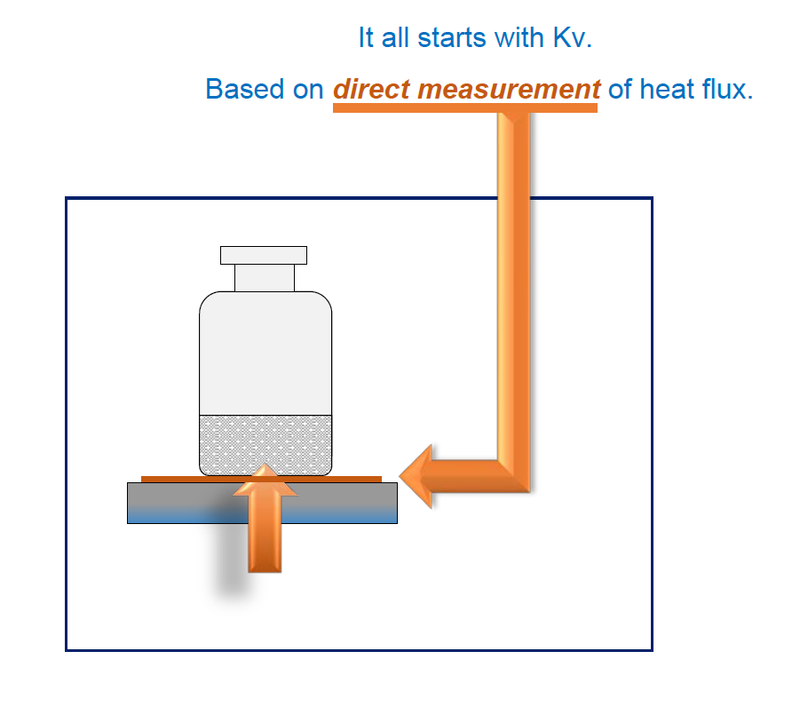 The direct measurement of heat flux with AccuFlux provides a new and valuable tool to understand what is happening within the product itself. It can be hard to transfer a freeze drying cycle from one freeze dryer to another because of equipment differences and the fact that traditional freeze drying protocol focuses on the shelf temperature and system pressure. The LyoPro Freeze Dryers focus on the product and determining what the product requires for effective freeze drying. 2. Optimize your cycle early for the highest through-put in the lab and in manufacturing with AutoDry. If the freeze drying cycle is not optimized then research and manufacturing costs could be significantly greater then they should be, wasting valuable time and money. 3. 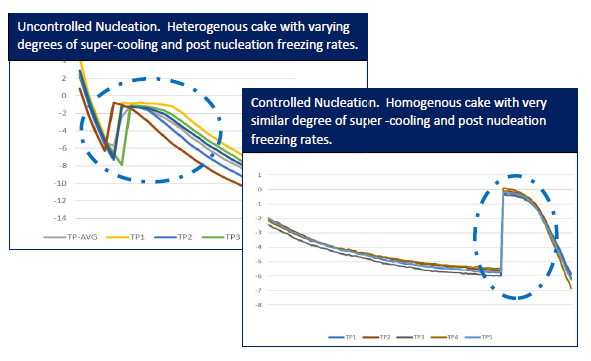 Create a homogeneous cake environment that creates synchronized, measurable events with Freeze Booster Controlled Nucleation. Thermal events in the product are often random and difficult to measure and are sometimes missed altogether. Mass Flow - The sublimation rate from the cake. If you have an existing freeze drying cycle you can run that cycle just like you normally do and the system will measure and provide the critical process parameters. LyoPro can create a homogenous cake structure and maximize the shelf temperature during primary drying to develop an appropriate freeze drying cycle. Optimization begins with creating a homogeneous structure by utilizing the Freeze Booster Controlled Nucleation. This helps ensure that every vial in the batch and vials from batch to batch are freezing in the same way. Forcing all of the vials to nucleate at the same time reduces batch variation and improves product quality. AutoDry increases the product temperature to its maximum safe temperature as quickly as possible during primary drying without exceeding the product's critical temperature. Capacitance manometer and pirani gauge convergence signals the end of primary drying and the system steps into secondary drying automatically. Cycle transfer can feel very dangerous, particularly if the product being scaled-up into production is particularly valuable and if the increase in batch size is significant. 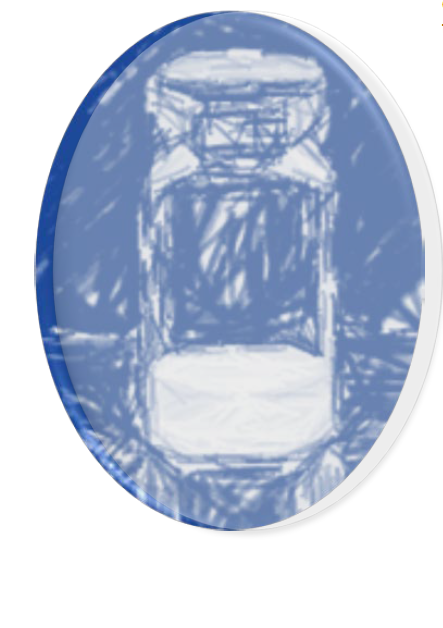 Utilizing tools provided by LyoPro can help to mitgate some of the issues that can occur during cycle transfers. LyoPro freeze dryers provide Kv (vial heat transfer coefficient). When the heat transfer coefficient of the recepient dryer has been measured and is understood a simple mathematical equation helps determine the target shelf temperature for primary drying. Because production dryers can seldom be taken off-line once in full operation the Kv is not always understood. In instances such as this the primary drying time can be extended to create a successful run. The LyoPro Freeze Dryers are available in 3 basic configurations. 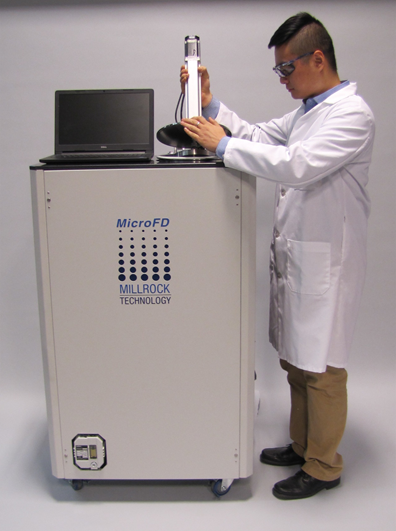 The MicroFD with LyoSim. For researchers who want to do R&D with as few as 7 vials. 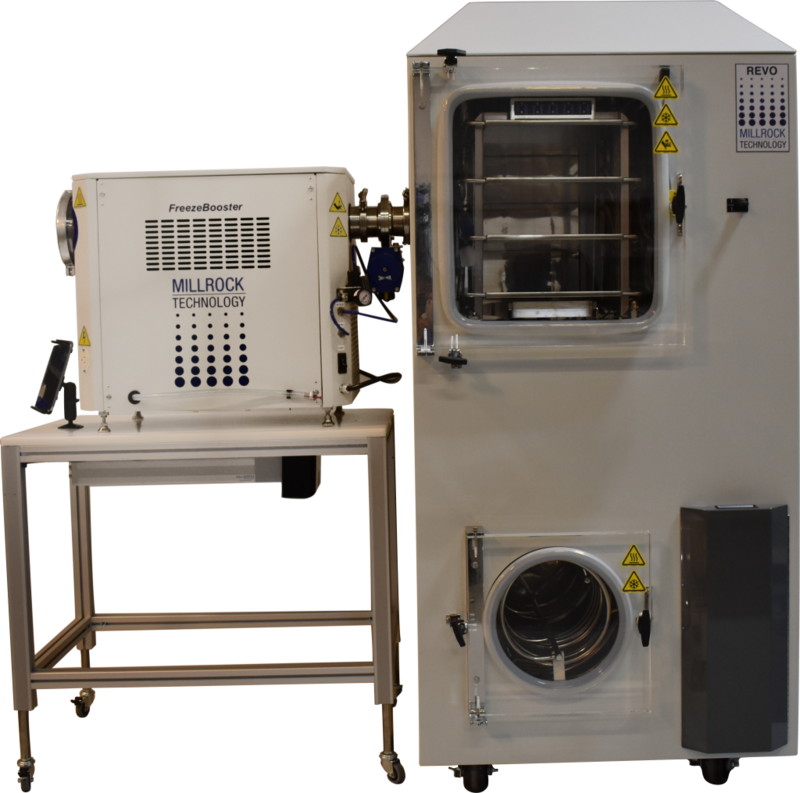 Exceptionally small batch runs provide fast turn-around and optimum lab throughput. The RevoPro Freeze Dryer. Researchers who want to perform full laboratory tray dryer runs. This unit is available with 1 to 5 shelves and 2 to 10 sq ft of shelf surface area. 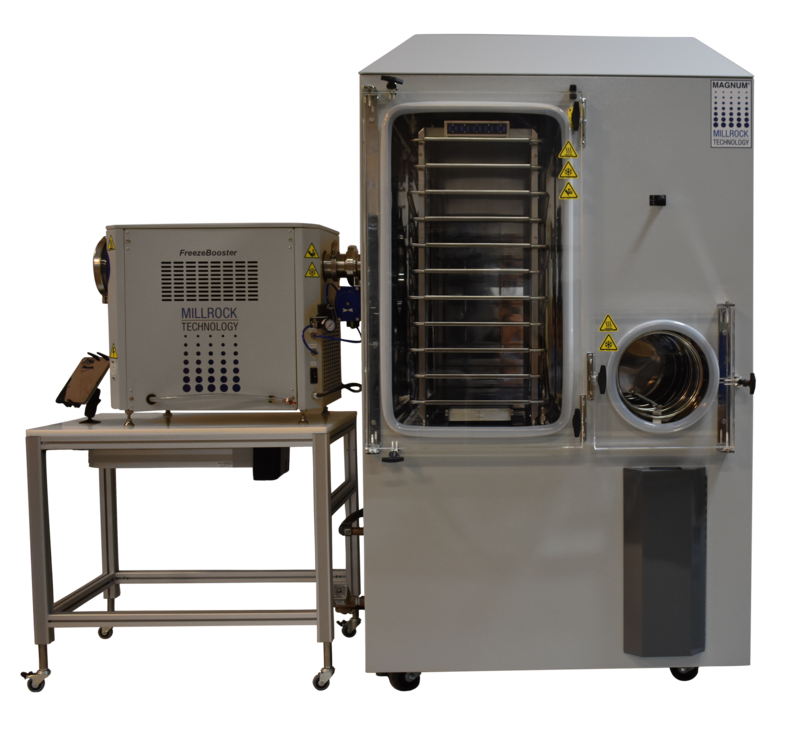 The MagnumPro Freeze Dryer provides pilot scale through-put but can also be utilized for R&D. The MagnumPro is ideal for processing larger batches but also being able to analyze, optimize and develop transfer cycles.